It was important to me to keep the lower tent-canopied workspace as an integral unit, separate from the upper living space of the Sky Yurt. This lower space would act as the mother ship, and the upper living space structure would actually “dock” to the trampoline frame at the center of the mother ship. But docking the Sky yurt structure by resting the lower beams on the trampoline frame created an additional bending stress on those beams.Maybe I could carry the weight of the Sky Yurt structure on the lower hub. I realized that the circular trampoline frame was incredibly strong in compression. 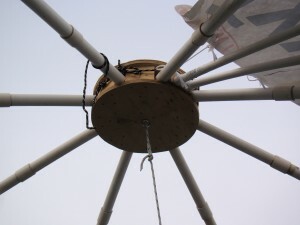 I could use cables from the frame to support a separate central lower hub that would support the Sky Yurt hub and provide a platform for a pillar that could be used to support the center of the floor as well. I used a bicycle wheel rim with drilled eye bolts for this lower support hub in the next prototype. 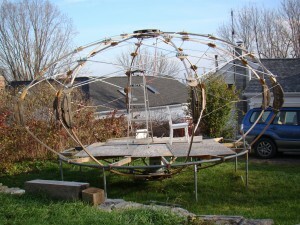 If I could use the trampoline frame to carry the floor and support the weight of the Sky Yurt by the lower hub, then the Sky yurt tent frame could be light and airy. It only had to support its own weight and the force of the wind on the tent fabric. As I worked to solve one set of design challenges, I kept learning that based on the new concepts, new challenges always emerged. If I was going the support the Sky Yurt tent upper structure on its bottom hub and just let it kiss the trampoline frame, then I needed to be able to move the bottom hub up and down, to get the right clearance from the beams to the tramp frame. All this started to come together when I began to build the second prototype in the summer of 2012. This entry was posted in Building, Design, Sky High Shelters, Sky Yurt, Uncategorized and tagged hub, tent on March 3, 2013 by macinessex. As I was working on my build/design project with the Sky Yurt, one big issue kept churning around in my mind – the power of the wind. I knew from sailing just how powerful the wind can be. On a sail, as the speed of the wind increases, the force on the sail increases exponentially.That’s why almost all boats have sails can be reefed and the sails have lines (sheets) so they can be depowered and lines (halyards) so they can be dropped completely. 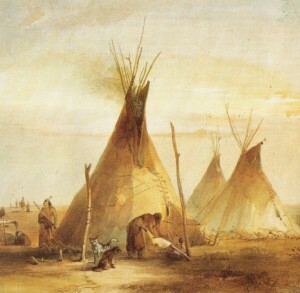 I began to look on the web for tent structures similar to the Sky Yurt – I wanted to see how professionally engineered structures dealt with wind forces on a large expanse of fabric. 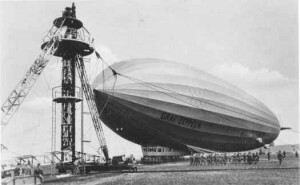 There are some huge fabric structures – most of these are tied to steel masts set in concrete and looked beefy enough to dock the Von Hindenburg zepplin. Way out of my league. One big concern was the fact that I really couldn’t find any-tent like structures that were set up like the Sky Yurt – none at all. I found tree houses well-secured to trees and structures built on slopes with some space underneath, but nothing that was trying to combine a large umbrella like work space with a living quarters above. It just might be that if similar structures were built, they were impossible to secure against strong winds, and blew way or were quickly abandoned. Working on dealing with wind forces was going to be a major challenge – and maybe would scuttle the whole project. I also knew that tent structures could be hot. Fabric can trap solar energy and hold on to it. We had an old army tent as kids and it could be stifling in the summer. I had to make sure the whole structure wouldn’t blow away, but also make sure that the air could escape from the workspace without congregating in the upper yurt. I also wanted decent airflow in the yurt itself. I had a sense that if I could design the shelter to be secure in strong winds, that solutions to the ventilation issues would suggest themselves. I started to look on-line for earth anchors and tie down straps, the kind they use to keep small planes from blowing away when parked on the ground. The project was getting more complex, more challenging and more exciting. This entry was posted in Design, Sky High Shelters, Sky Yurt, Uncategorized and tagged sailing, sails, tent on February 7, 2013 by macinessex. My first goal in building a full scale prototype was to see if the basic engineering for the Sky Yurt tension structure would work. The PVC pipe was 2″ in diameter, dirt cheap (I did have to wash it all) and under tension I could get it to bend. I built two plywood hubs, about 2 feet in diameter with slots for the PVC beams made out of 2×4’s sandwiched between the top and bottom plywood circles. On the ends of the PVC beams I added end caps with eye bolts to catch the stainless steel cable. I had a primitive system to tension the outside cable. The structure went up with a minimum of hassle. 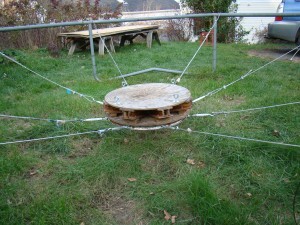 It nestied inside the 14 foot diameter trampoline frame Andy and I bolted together. As I increased the tension on the Sky Yurt structure the PVC beams wanted to move closer together. They began to bend in a sweet curve vertically, but they also wanted to begin to bend horizontally. Also they wanted to rotate the hubs so that the beams could begin to “pass” each other. 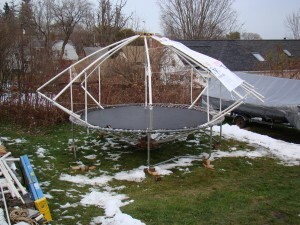 Another problem – the lower beams were resting on the trampoline frame; they were carrying the weight of the whole Sky Yurt structure, and were beginning to bend upward. 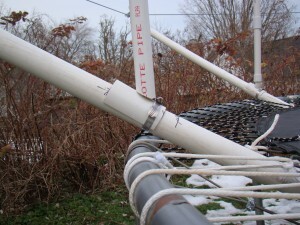 I experimented with adding struts – 1/1/2″ PVC pipe – between the upper and lower beams. It was fun using the chop saw that Andy lent me to cut PVC fittings at the angles I needed to connect the struts with the beams. The struts, by tying together the upper and and lower beams, added lots of rigidity to the beams, but I wanted a structure that could be tensioned, so it needed to be strong, but flexible. I didn’t want to make the lower beams beefier than the upper beams. I would be screwing around with the symmetry, making the structure more complicated, and even more difficult for me to get my head around. One thing that was clear was that I would need beams that had a rectangular cross-section or a built-in vertical curve to minimize sideways bending under tension. I was also going to need some cross bracing between the beams to provide support for the cover and to stiffen up the beams. I did end up with a pretty elegant set of solutions to these issues that were incorporated in the second prototype. This entry was posted in Building, Design, Sky High Shelters, Sky Yurt, Uncategorized and tagged PVC., tent, trampoline on February 4, 2013 by macinessex. To hold the Sky Yurt up in the air, and to attach the awning for the workspace I was going to need a strong core structure. 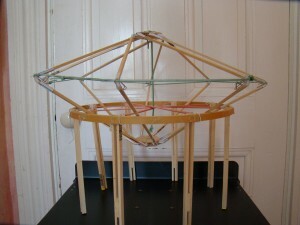 But the Sky Yurt itself could be made of much lighter structural materials. It only had to hold itself together, like a pop-up camping tent. I was driving into Willsboro one afternoon and saw a backyard trampoline with a kids low play tent stretched over tramp. I knew about trampolines from my trimaran sailing. A few people jumping on a trampoline generate a strong downward force that needs to be resisted by the frame. So trampoline frames are built to be very strong. .But they are also portable and are pretty light for the stresses they have to deal with. For the next model I went hunting for circular rings. Found what I was looking for in a craft shop – those hardwood rings that are used for needlepoint work. I made a new balsa wood and plastic straw model, and I really liked the look and feel of it. I was ready to build my first prototype. Now I was getting into the real building project. My scare-level increased to the point where I thought I might need to start wearing a metaphorical diaper. 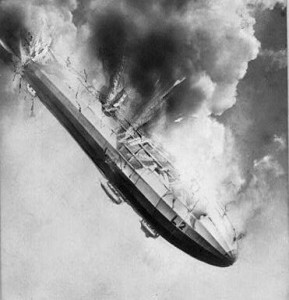 I asked my friend Andy Wekin – he was an artist who had gone back to school to be an engineer and he came with his partners Otis and Ezra (more on this team later) – to be the consulting engineer. I found a trampoline frame on Craig’s List and hauled it home. They are really available, sort of like old hot tubs and spas. They are in those class of things that at the time seem like a good idea, but they stop being used (you don’t want your kid to break her neck) and they take up space a lot of space in the outdoors. My friend Robin runs a preschool at a farm. They had a lot of PVC pipe that had been used in an irrigation project, and for a small donation I had my beams. I made hubs out of plywood and scrounged for PVC connectors that I could cut up and experiment with. I had SS wire from some of my old sailing rigs. Mostly I wanted to learn from this first structure -see if the basic engineering would work, where I would need extra support and how the Sky Yurt structure would interface with the trampoline frame. And it started out looking pretty promising. This entry was posted in Design, Sky High Shelters, Sky Yurt, Uncategorized and tagged Andy Wekin, models, tent, trampoline on January 29, 2013 by macinessex.